People who use Microsoft Outlook for business rely on the Outlook Notes feature. Insurance agents, for example, will use Outlook Notes to document details about each claim. Outlook Notes can be attached to an Outlook Contact record, letting agents search for a contact and quickly see the notes they’ve made. Agents can also sync Outlook Notes with Android phones and tablets using CompanionLink. Download CompanionLink for Outlook. It’s free to try for 14 days. Configure it to sync Android with Microsoft Outlook. Make sure the Outlook Notes checkbox is checked. CompanionLink for Outlook is a PC software product that synchronizes Outlook Notes with Android devices. The sync is two-ways so changes made on the Android device or in Microsoft Outlook are always updated. If you configure CompanionLink to use their DejaCloud service, all your data will synchronize over-the-air without the need to connect your Android device to your PC with cables. CompanionLink works together with an Android app called DejaOffice. The app stores Outlook Notes, Contacts, Calendar, and Tasks from your PC. In the example above of our agent, links between Outlook Notes and Outlook Contacts are maintained on the Android, just like on PC Outlook. Categories are also maintained, allowing you to map all of your Outlook Categories from your PC to your Android. DejaOffice is available from the Google Play Store. BlackBerry 10 arrives on January 30. BB10 sync to standalone Microsoft Outlook is a topic that no one is talking about. If your company runs a Microsoft Exchange Server, BlackBerry Enterprise Service 10 will manage over-the-air sync of Outlook data to BlackBerry 10 devices. People without Microsoft Exchange who are using the version of Microsoft Outlook that came with MS Office are left without any tools for bb10 sync. Google’s end of life announcement for free Google Sync services devastates BB10 users with Outlook. People with free Gmail accounts can no longer sync Outlook to Gmail to BB10 devices. This directly affects standalone Outlook users because their data is now isolated on an island (ie – Outlook) with no options from RIM to get the data to BB10 devices. Legacy BlackBerry devices used BlackBerry Desktop Manager to solve this problem. However, BBDM will not ship with BB10 devices. CompanionLink will offer direct BB10 sync support for standalone Microsoft Outlook. BB10 sync options will include USB sync that works similar to BlackBerry Desktop Manager, and DejaCloud sync that works over-the-air. CompanionLink will ship their BB10 sync solution the same day the first BB10 devices arrive in people’s hands. Support for Outlook 2000, 2003, 2007, 2010, and 2013 will be included. For more info on BB10 sync, bookmark this page that will be updated by CompanionLink as more news about BB10 emerges. The first Galaxy Note device had a 5.3-inch screen. Galaxy Note II stretched the limits even further with a 5.5-inch screen. Galaxy Note III is rumored to have a gargantuan 6.3-inch display. The linchpin behind phablets is to achieve nirvana between desktop productivity and the mobile form factor. People with mobile devices do not want to squint to read tiny, high-resolution font. They hate being given a 10×10 pixel area button that accurately engages on only 60% of their tap attempts. People who want a “large enough” screen for business productivity in a pocket-able form factor turn to phablets. Phablet sync is a key factor in mobile productivity. Business users of phablets need a way to get their contact records and calendar agenda onto their phablet. With phablets going mainstream, PC to phablet sync and smartphone to phablet sync will be in demand. CompanionLink offers a simple solution for this called DejaCloud. With one username and password, contacts and calendar information will be synchronized between PC, smartphone, and phablet. This technology is available today for phablet early-adopters. Industry blogs shows that RIM will replace BlackBerry Desktop Manager with a product called BlackBerry Link with their new BlackBerry OS 10 launch. 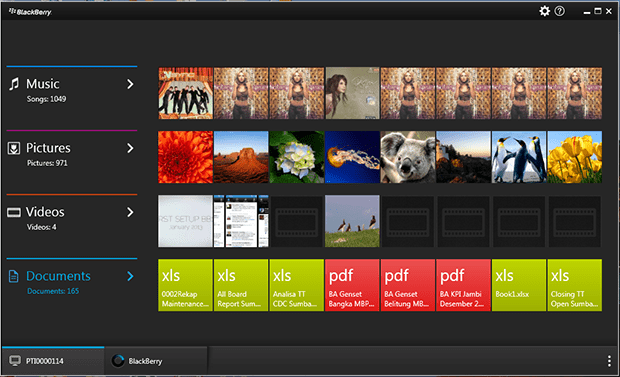 Screenshots leaked on various blogs show BlackBerry Link will manage pictures, music, video, and documents. However, there have been no screenshots showing support for BlackBerry Link Outlook Sync. Will RIM abandon their reliable USB sync between Microsoft Outlook and BlackBerry? CompanionLink plans to support synchronization between Microsoft Outlook and BlackBerry OS 10 devices. You can choose from USB sync (works like BlackBerry Desktop Manager) or secure DejaCloud wireless sync. Please bookmark this website to stay current with the our latest news about BlackBerry 10 Outlook sync. Samsung has a new ad promoting the Galaxy Note 2 as a business device. We couldn’t agree more because CompanionLink gets lots of calls from people asking about Galaxy Note 2 Outlook Sync. These business people are crippled without their Outlook calendar, contacts, notes, and tasks on their Galaxy Note 2. CompanionLink has software for Galaxy Note 2 Outlook sync. Download CompanionLink for Outlook from here. It’s free to try for 14-days. During configuration, select Android for device, DejaCloud for method, and Microsoft Outlook for database. The Note 2 blurs the line between the three most popular mobile computing form factors – laptop, phone, and tablet. The large 5.5-inch screen on Galaxy Note II gives business people laptop-like productivity. The powerful quad-core processor makes Excel calculations a breeze and allows you to simultaneously run apps. The device runs the famous TouchWiz interface. Google stopped distributing their Google Calendar Sync program on December 14, 2012. You can read about that here. The called this a “Winter Cleaning”. CompanionLink feels there are still thousands of people who need a Google Calendar Sync program to keep their Outlook and Google accounts integrated. CompanionLink for Google is another Google Calendar Sync program that does everything Google’s software did, but also adds features like synchronization of contacts, categories, tasks and contact photos. 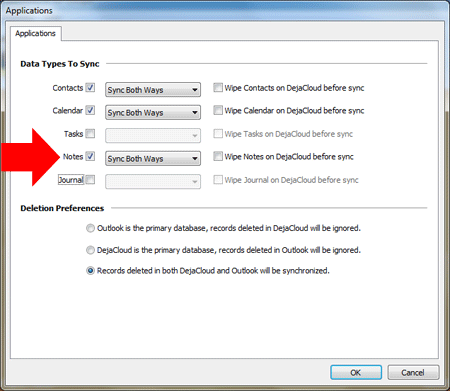 CompanionLink can be set up to sync multiple Outlook calendars to Google Calendars. You can sync Outlook contacts and calendar categories with Google. Calendar details such as accepted meeting invites and recurring appointments are handled flawlessly. Outlook task priorities and due dates sync over to Google nicely. Your contact notes, appointment notes, and task details sync to Google as well. For a full list of Outlook data supported in CompanionLink’s alternative for the Google Calendar Sync program, please click here. A very common customer service request we get is from people asking how to sync Google Calendar with Outlook 2007. Many people are still using Outlook 2007 because it is the last version of Microsoft Office that used the famous ribbon-less interface. We have good news – CompanionLink for Google is a $14.95 tool that allows people to sync Google Calendar with Outlook 2007. CompanionLink also has a feature to sync Google Contacts with Outlook 2007 that is built right into the product. Google used to offer a tool to sync Google Calendar with Outlook 2007. The tool was called Google Calendar Sync. Google stopped distributing that tool on December 14, 2012. Here’s the workaround to sync Google Calendar with Outlook 2007. Download and install CompanionLink for Google to your PC. During configuration, select “No device – sync with Google” from the list of device types. Select Outlook as your database. By default, contacts, calendar and tasks will synchronize between Google and Outlook 2007. If you want to change this, you can do so in the Advanced Settings area. CompanionLink for Google can also be set to automatically synchronize Google Calendar with Outlook 2007. Go to Advanced Settings > Sync Timer. You can select how often you wish to sync Google Calendar with Outlook 2007. Integrating Outlook 2013 with Gmail just got a little more complicated. Google announced that they will cease support for Google Sync (which runs on Exchange ActiveSync technology) for new users on January 30, 2013. New Gmail accounts will not be able to use Exchange ActiveSync without a paid Google Apps account. Here’s a workaround for integrating Outlook 2013 with Gmail. 1. Set up Outlook 2013 with Gmail IMAP to get email capabilities in Outlook. A. Set up your Gmail acccount with IMAP. 2. Use the CompanionLink for Google tool to sync Outlook 2013 with Gmail. CompanionLink will sync Outlook and Gmail contacts, calendar, and tasks. It’s available as a free trial for 14 days. Just $14.95 to buy and works on multiple PCs. Credit steps in #1 above to Tiaan. Google discontinued distribution of their free Google Calendar Sync tool last week. This affects people who need to sync Outlook calendar with Google calendar. Google’s announcement left many people clamoring for a Google Calendar Sync alternative. CompanionLink has a Google Calendar Sync alternative for $14.95, CompanionLink for Google synchronizes Outlook calendars, contacts, tasks, categories, and contact photos with Gmail and Google Apps accounts. You can install CompanionLink on three computers for $14.95. Free US-based phone support and software updates are included. Like a true Google Calendar Sync alternative, CompanionLink can be set up for automatic sync between Outlook and Google on a 5-minute timer. CompanionLink runs in your system tray on your PC desktop and will synchronize changes between Outlook and Google. Outlook 2000, 2003, 2007, 2010, and 2013 are fully supported, in addition to Outlook Business Contact Manager 2007 and 2010.